Last night, we heard the sad news that a pretty cool sounding Kickstarter project called POP (aka Point of Power) had to refund a record $100,000 to investors because Apple had determined that the product violated its policy on using the new Lightning adapter. It wasn't initially clear why Apple had made the ruling, but it was assumed that it was because the Lightning connector is a proprietary technology (not a bad assumption with an Apple product), but Apple has now explained itself, and changed its policy. No word on POP's fate though. Apparently, the problem wasn't with the device using the Lightning plug, but rather that POP had a Lightning plug alongside the legacy 30-pin plug for older Apple devices. But, as we know, the best way to get Apple to change a policy is to give the company some bad press, and so the company has now decided to change its policy and allow for this sort of product to be made. We don't know yet what will happen to POP, but it seems like the product should be able to go through as planned, assuming the refund process hasn't gotten too far along. The people behind POP should keep at it. I'd heard though (not reliable, so not cited) that they'd already begun the refunding process and were at a few thousand dollars or so. While investment is at its roots a gamble, uncertainty is a big detractor in continued investment. Hopefully they'll make back any lost prospects. Don't be surprised to find out that it is blindly backed by few politicians. Remember G D Searle? The company (IIRC) that still makes Aspartame crap? And remeber Donald Rumsfeld who is said to have pushed this crap through FDA using his clout? 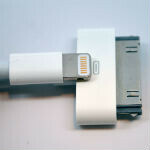 Why can't they come out with something like the iPad 3 USB adapter for the iPhone 5? Because that would not earn money for them, now Apple has patent for Lightning connector and can milk manufacturers of accessories. There is a lightning to USB adapter, but they only support it on the iPad because it makes sense to want to get pictures onto the iPad for iPhoto or Photoshop, it doesn't make as much sense to do the same thing with an iPhone. stealthd, you are one funny guy. You should use a standard phone with USB, you will realise how easy your life can be. Every One Has to Agree That Samsung Changes It's Products For The Coustomers.Apple Forces Its Coustomers To Change. Maybe this was just a publicity stunt by POP. I mean, what a coincidence that the guy behind POP is also a founder for a Kickstarter competitor that just so happens to support refunds directly. I'm just speculating here (or conspiracy theroizing), but maybe he started this whole project knowing or hoping Apple wouldn't authorize it, so then his Kickstarter competitor saves the day when he uses it to get his Kickstarter investors refunds. What would be crazy, if Apple just bought POP off of the guy after not allowing them to manufacture due to their policy, then they turn around and change their policy after they own it. It was a stupid policy anyway. You cant make a cord that supports their older devices and their new one. Its probably because they make more money if you have to buy two seperate cords off of them.